Vape Breakfast Classics consists of three breakfast themed flavors, including Pancake Man, French Dude and Mr. Blintz. Element Vape sells each eliquid flavor in the line for $16.95 per 60mL Bottle. Nicotine strengths are 3mg, 6mg, and a Zero-Nic option. Vape Breakfast Classics are 80% VG 20% PG eliquids, and are made with top-shelf ingredients. The Spinfuel VAPE Eliquid Review Team spent three full days with Vape Breakfast Classics. Each of the four members of the team received one 60mL bottle per flavor. 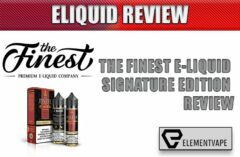 These eliquids were provided by Element Vape for the purposes of this review. 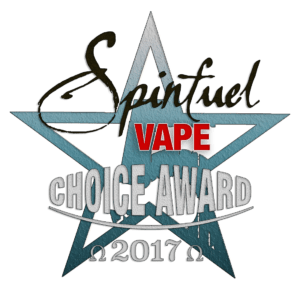 NOTE* At the time of this review period the entire Spinfuel VAPE staff, including, John Manzione and Dave Foster, were using many devices that were still under review. The eLiquid Review Team based their experience with these eliquids to assist in determining, at least partially, the performance and value of the devices under review and will be reflected in their upcoming reviews. For this review, I decided that “flavor fidelity” was more important that vapor production for this particular line of ejuice. That being the case, I chose the new SMOK Spirals Flavor Sub-Ohm Tank, a remarkable tank designed to reveal the deepest flavor from any eliquid, including High or MAX VG blends. I chose the 0.6Ω coil head for these eliquids, and found the best wattage to be 22W. With a wattage range of 18-35W, I found the thicker the juice the lower on the wattage range I needed. I used my SMOK Alien box mod purely for aesthetics. My chosen vape gear for Vape Breakfast Classics was my Vaporesso Attitude Starter Kit. The size and shape of the Attitude mod is the perfect size for me, and the included Estoc tank (called the Attitude Sub-Ohm Tank) with the new EUC coil technology proved to deliver incredible flavor and more than ample clouds. The new drop in coil ‘core’ system proved to be incredibly easy to use. The 0.4Ω EUC Clapton coil, rated 40-50W provided the best performance at 52W, just above the stated range. The last day of the review I used the Innokin Kroma Starter Kit. I enjoyed the Kroma and the included tank performed well. The large, powerful WISMEC Reuleaux RX300 and Reux sub-ohm was my choice for this review. I had hoped to have the MELO 300 on hand for it but it arrived too late. The REUX tank comes preinstalled with the RX Triple coil with a resistance of .15Ω and rated at 60W to a whopping 160W. The thick, sweet, eliquids in the Breakfast Classics couldn’t take any higher than 100W with the REUX, and proved to work best at 90W. Flavor and cloud production was insane. I had several new pieces of vape gear to choose from, but I was intriqued by the new Joyetech eVic Primo so I decided to use it for this review. The Starter Kit version comes with the UNIMAX 25 (25mm) atomizer. I used the new BFXL Kth-0.5Ω Direct Lung (DL) coil head. This coil head uses Kanthal A1 and organic cotton, making it perfect for true flavor fidelity. The wattage range is 30-50W, and for the Vape Breakfast Classics I found 38W to be ample, though I did push it to the upper limits without a problem. At 50W this coil produced very warm vapor, but altered the sweet flavor just a little. For warm and enormous flavor, 38-40W will probably work best for you too. As we went to press, Vape Breakfast Classics is limited to three (3) flavors, all very sweet, syrupy flavors that hit room as a morning vape choice. While different blends deliver different flavors, all three fit the notion that the brand certainly produced breakfast flavors and aromas you would find in a Denny’s or Friendly’s restaurant. From pancakes slathered in butter and maple syrup, with hints of strawberry, to French Toast topped with cinnamon and maple syrup, to the unique blend of apples, butter, whipped cream and even hints of a sweet crepe, these three blends taste like a diabetic’s nightmare, and produce the most aromatic vapor we’ve ever experienced. If you want to fill a room with the aroma of a great breakfast, these are eliquids you’ll want to try. Vape Breakfast Classics are available at Element Vape for $16.95 per 60mL bottle. Element Vape carries a large assortment of top shelf, high quality eliquids from famous brands made in the U.S. The best thing about buying eliquids from Element Vape is the price, almost always less than you’ll find anywhere else, and the fastest shipping we’ve seen for any eliquids. Julia: 5 Stars – The one thing Jason, Tom, and myself agreed on was that as delicious as these breakfast classics are, they are not all-day-vapes. Only Kiera found them to be so, but Kiera is a sucker for sweets. In any case, Pancake Man is blended to be the closest thing to actual pancakes covered in melted butter and drenched in maple syrup. My first lung hit, a full 5-second pull using the flavor tank from SMOK, the first overwhelming flavor, and aroma, was the sweet maple syrup. This maple syrup begins with the inhale and lasts after the last wisps of vapor has evaporated into the air. In between, especially with a slow exhale, the authentic flavor of buttermilk pancakes with bits of strawberry (and maple syrup of course) overtake your taste buds and tricks your mind into believing you’re enjoying the best pancakes you’ve ever had. Vaping Pancake Man for more than two hours didn’t turn out well for me, a case of Vapers Tongue developed and I had to stop. That said, those two hours were sublime. Kiera: 5 Stars – I agree that an award winning ejuice does not need to be an all-day-vape, but it just so happens that all three breakfast classics are all-day-vapes for anyone that adores sweet breakfast-sy flavors. Vaping Pancake Man is as close as I’ve ever come to inhaling vaporized pancakes sopping in butter and syrup, with just a hint of succulent strawberries on the tail end of the vapor. I enjoyed Pancake Man the most when the wattage was high enough to produce very warm vapor, but not high enough to scorch the flavor. If you too enjoy breakfast classics like Pancakes or French Toast, then by all means give these wonderful eliquids a try. If you do, make sure that the tank you use is primed to deliver deep authentic flavors. For my preferences flavor is best expressed with Kanthal/Cotton or Ceramic coils. 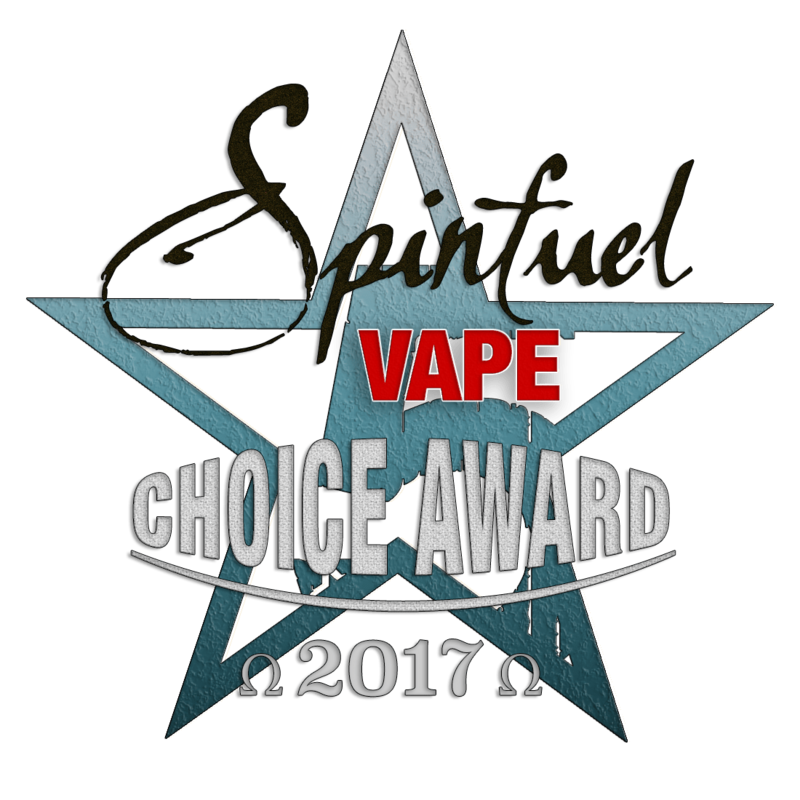 Tom: 5 Stars – I have no problem awarding any of these eliquids 5 Stars based on quality, flavor fidelity and vapor production. Vape Breakfast Classics are amazing reproductions of warm, syrupy breakfasts. 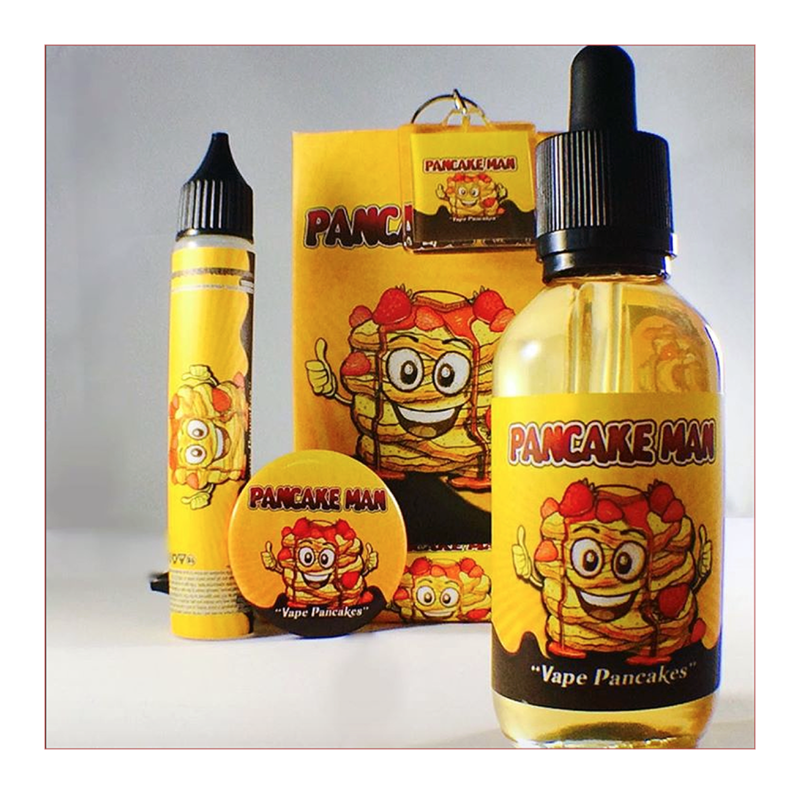 Pancake Man in particular reproduces the taste of pancakes and maple syrup like nothing I’ve vaped before. I was surprised that they pulled it off as good as they did. However delicious Pancake Man is, the flavors are so sweet that there is only so much time I can vape them before I need to swap it out for something a lot less overwhelming. But for the few hours that I can vape them, it’s like sitting down to an enormous breakfast of sky high stacks of pancakes, gallons of syrup and a tub of sweet butter. The official description mentions strawberries, and for the first several lung hits the essence of strawberries is in the last of the vapor, but it disappears in no time, leaving behind pancakes and syrup. Frankly, pancakes and syrup are plenty. Jason: 5 Stars – If Vape Breakfast Classics had done ‘less than spectacular’ job creating a pancake/syrup/butter/strawberry blend I wouldn’t be able to award Pancake Man with 5 stars. But, the fact is, Pancake Man tastes exactly like real pancakes and real maple syrup. I imagine there are certain people that do not like pancakes, and for them this is a eliquid to avoid. However, if you do like pancakes you will be shocked at how authentic Pancake Man is. The thick clouds of vapor give off the intense aroma of maple syrup so heavy that for some it could be sickening, for others, heavenly. But, no matter how much anyone can love pancakes soaked in syrup, it’s just not something that can be vaped all day long. If you want to start the day, or end the day, with the sweet taste of pancakes and maple syrup, you have to try Vape Breakfast Classics. Julia: 5 Stars – The first time I’d heard of French Dude was when Dave told me that this was Mike’s all-time favorite ejuice. He had just placed an order for Mike and when I read the official flavor profile I made a mental note to, someday, bring these eliquids in for a team review. It took several months, but French Dude and the two others in the breakfast line, are finally being enjoyed by the team. So, is French Dude some special ejuice that deserves the adulation that seemed to come from Mike, or was Dave exaggerating about Mikes’s favorite juice? The answer to the question above depends on how much you like this type of eliquid; the super sweet breakfast foods with lots of maple syrup. French Dude is an authentic French toast flavor, topped with sweet cinnamon, bits of blueberries, and a healthy splash of pure maple syrup. Authentic French Toast with all the fixings, intense clouds of aromatic vapor, French Dude is a lot like Pancake Man, only this time around its not pancakes at the core, it’s real French Toast. Kind of amazing really. Kiera: 5 Stars – For more than 5 years we’ve been reviewing eliquids by spending 3 or more days vaping various brands exclusively in order to know these eliquids better than any other reviewer can. You can’t vape an eliquid for a minute or so and declare it a great flavor or a terrible flavor. Like anything else, eliquids must be experienced under a variety of conditions. This is especially true for Vape Breakfast Classics. 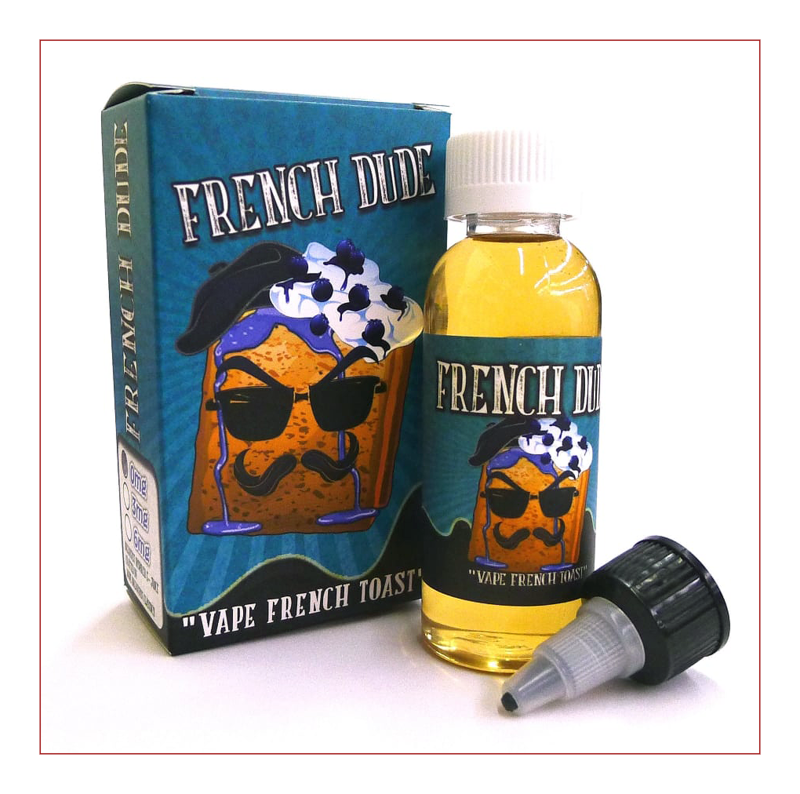 French Dude is a combination of thick-tasting flavors including French Toast, cinnamon, blueberries, whipped cream, and maple syrup. Try to imagine these flavors, it shouldn’t be difficult if you’ve ever had French Toast with syrup. Imagine experiencing this flavors under the hot Florida sun in midday, or after a few beers or a few glasses of wine, or even after vaping a tobacco flavored eliquid just prior to vaping French Dude. Not very appealing, is it? Now imagine these flavors in the morning, under the proper pretexts, sitting at the breakfast table, or in a Denny’s. Now these flavors sound more appealing, don’t they? This is why it’s important to spend time with every eliquid and discover the best conditions, and the best vape gear for them. French Dude is an eliquid you start the day with, when French Toast and maple syrup make sense (other than the occasional ‘breakfast for dinner’ special nights). I found that I could easily vape Pancake Man all day long, but when it came to French Dude it was harder to enjoy as an all-day-vape. Whether or not this is an all-day-vape, the certainty of French Dude is that it is marvelously decadent, and spectacularly delicious, and amazingly aromatic. Tom: 5 Stars – Like Pancake Man, I’m awarding the 5 stars for authentic flavor, thick aromatic vapor, and the utmost in quality. Where French Dude has the edge, with me anyway, is the flavor of French Toast over that of the more everyday pancake. French Toast is special, and the way Vape Breakfast Classics created it shows amazing artistry. French Dude’s flavor begins on the inhale with a sudden sweetness of maple syrup. On the exhale the authentic French Toast flavor floods the taste buds with the added flavors of sweet cinnamon, a dash of cream (whipped cream?) and a hint of blueberries on the very end of the flavor train. The thick flavorful vapor fills the room with this French Toast and maple syrup concoction that lingers for several minutes. Not an all-day-vape for me, but a spectacular vape for a few hours at a time. Jason: 5 Stars – I am a big fan of French Toast, drenched in syrup, with a side of crispy bacon. If I’m out at a restaurant in the morning hours French Toast is what I always order. That being the case, as soon as I received my review bottles I went straight for the French Dude, and I was not disappointed. French Dude is a remarkable blend of French toast, maple syrup, whipped cream, and topped with sweet ripe blueberries. When I order French Toast at a restaurant I don’t ask for blueberries, and thankfully, the French Dude goes lightly on the blueberries. Like the other in Vape Breakfast Classics, French Dude produces a thick aromatic vapor that fills the room quickly. On the inhale, I immediately taste maple syrup, but on the exhale the rest of the flavors begin to catch up. First, after the syrup, is the French Toast flavor, then this sense of creaminess, and finally blueberries. These flavors remain faithful for about 2 hours, no more than that. Unfortunately, more than a couple of hours deaden the tastebuds until I can’t taste anything. Once that happens I have to put it aside and head in the opposite direction with a new flavor. During the review period, I would put down French Dude and look for something different, but as luck would have it, we are restricted to vaping only the eliquids under review. For me that meant I could switch to Pancake Man or Mr. Blintz. I decided on Mr. Blintz after reading the flavor profile, hoping the green apples and ricotta cheese was different enough to begin repairing my vapers tongue. The bottom line is that Vape Breakfast Classics has created the most authentic breakfast foods in vapor form. Mr. Blintz, while not being 180 degrees different than French Dude, did provide a nice distraction. Julia: 5 Stars – Pancake Man and French Dude have similarities with each other that Mr. Blintz does not share. In addition, the order of the flavors as they present themselves is also different from the other two. With a strong lung hit the only flavor hinted at is tart green apple, followed by a flavor I couldn’t identify but that fit the green apples just fine, and finally a vanilla crepe flavor that I couldn’t get enough of. In fact, Mr. Blintz finally gave me an all-day-vape eliquid from Vape Breakfast Classics. A crepe is, basically, a very thin pancake, but instead of the buttermilk and flour that goes into pancake batter, crepes are made with wheat or buckwheat flour, they use less sugar, no baking powder, and there is a definite ‘eggy’ taste to a good French crepe. Does this flavor profile fit Mr. Blintz? Well, yes, for the most part. I guess Vape Breakfast Classics could cheat a bit, using the same flavoring that went into Pancake Man, and let it double for the “crepe”, and using a green apple flavoring and a ricotta cheese flavoring (if there is such a thing) to pull the flavors further apart, but after 3 days with these juices I don’t think they did. A crepe stuffed with apples, soft cheese, and whipped cream, is more of a breakfast dessert rather than a breakfast entree. So, while all three eliquids are sweet, Mr. Blintz is a different kind of sweet. Because it is a little less sweet, with a definite apple component, I found that this is the one I could enjoy all day without suffering any vapers tongue annoyances. Kiera: 5 Stars – Overall I think that very few vapers would dislike any of the eliquids from Vape Breakfast Classics. That said, I think very few vapers would find enough flavor diversity among these three eliquids to have them be the ‘only’ eliquids a vaper would use. As far as Mr. Blintz goes, I think this is the one that has set itself apart from the other two. Mr. Blintz is quite different than Pancake Man or French Dude, but just as sweetly delicious. It’s one thing to claim that you’ve developed a crepe flavored eliquid, it’s quite another to deliver it. I mean, Pancake Man is pancakes, lesser brands might consider using pancake to pass it off as crepes when they could mask the flavor with apples and cream. Instead, Vape Breakfast Classics did create a base flavor that tastes exactly like real crepes, and that difference lies in how this crepe flavor has an almost toasted egg flavor component, a tiny touch of vanilla. Along with this authentic crepe flavor, there is a sweet scoop of green apples, whipped cream, and a particular flavor component that I could easily buy as ricotta cheese (though I wouldn’t swear to it). In other words, this blend of flavors creates a French breakfast dessert the likes of which I’ve never had before. Lastly, while the clouds of vapor are as thick as the others, the aromatic nature of the vapor is less pronounced. Tom: 5 Stars – Despite Mr. Blintz being somewhat less sweet than the other two eliquids, I did not enjoy it as much as I did Pancake Man. (though I did enjoy it) It still gets the 5 stars based on the usual things; quality, authenticity of the flavors, and wicked amounts of vapor. Mr. Blintz is a crepe dessert breakfast food, and I’ve had crepes before, a few times, filled with various pie filling fruits like blueberries and apples, and I can say with some certainty that the crepes flavor profile is definitely here in Mr. Blintz. While Pancake Man and French Dude are almost overwhelmingly sweet and full of maple syrup, Mr. Blintz is something very different. All the flavors hit on the exhale, and the vapor isn’t as aromatic as the other two, so while I did like it, and recommend it to vapers that enjoy dessert crepes, expect a less overpowering vape experience. Jason: 5 Stars – A real dessert ‘blintz’ is a very thin pancake filled with cheese and/or fruit, then fried or baked, with powdered sugar on top. Although the definition of a blintz uses the word pancake, the taste is very different. Thin pancakes, or crepes, isn’t made with the same ingredients most pancakes are; the batter uses less sugar, and most use a different type of flavor. Crepes also don’t have baking powder in the recipe, the very thing that give pancakes fluffiness. The biggest difference between a pancake flavor and a crepe, or blintz flavor, is that crepes can be used to wrap sour cream, caviar, spinach, ham, and even mushrooms. That makes Mr. Blintz a dessert blintz since the flavors used here are apples, whipped cream, and butter. And Mr. Blintz is one awesome eliquid. Like the others in the Vape Breakfast Classics, Mr. Blintz is an 80% VG, 20% PG blend, meaning the cloud production is on par with the other two; massive. But, since there isn’t any maple syrup involved the vapor isn’t as aromatic. I vaped 60mL in a little more than a day, and I’ve definitely added it to my rotation. While I would vape it all day long, I’m going to restrict my vaping of Mr. Blintz to early morning or early evening. The three, award-winning breakfast vapes from Vape Breakfast Classics are tailor made for vapers looking for these types of sweet flavors, or looking for very sweet treats that deliver a lot of flavor and very aromatic vapor. These are 80% VG, 20% PG blends, providing huge amount of vapor, and two of them are heavily aromatic. Vape Breakfast Classics are available at Element Vape for $16.95 for a 60mL bottle. If our experiences with any of these eliquids interest you then you are the right person to try them. Pancakes and French Toast drenched in maple syrup, or a dessert blintz with apples, Vape Breakfast Classics deliver the goods.